Have I mentioned that I live about a mile from Target before? In case I haven’t, you might have figured it out by some of my snaps already. Target is like my second home! I’m an avid Cartwheel user and I especially love when they offer their text coupons. Because who isn’t down to save some cash? Especially during the holidays! We are a family that loves to include our four-legged pets into the spirit of Christmas and gift giving. So Target is the place I love to shop at, it’s convenient and basically my one stop shop for everything I need. 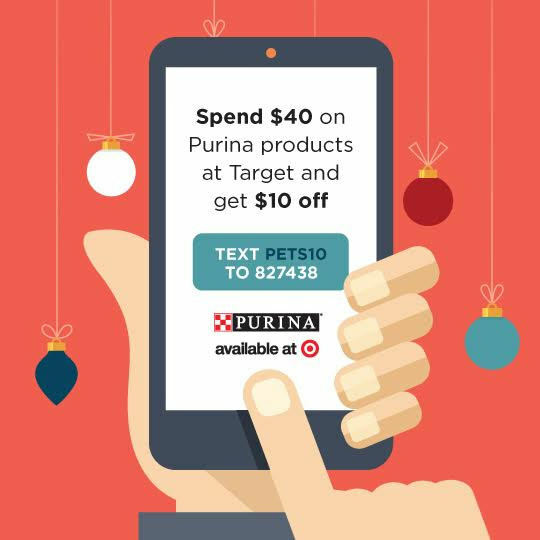 And for all of us with furry friends who LOVE Purina products as much as my little Charlie does, starting the week of December 4th, Target will have an exclusive mobile coupon to save $10 off a $40 purchase of Purina products! Just text PETS10 to 827438 (data and messaging fees may apply.) I use Target’s exclusive coupons so much, my phone already recognizes the number! It’s seriously SO easy to use and redeem. 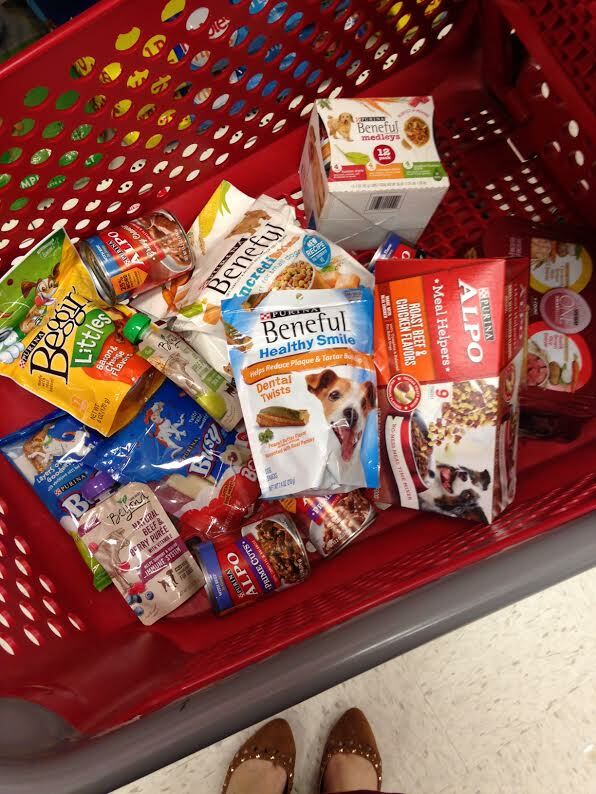 And since Purina has a plethora of products at Target, you can find something your pet loves, along with a few extras, like I have done for gifts. This year I decided to gift our family pets a stocking stuffed with all of their favorite treats and goodies. I found the cutest stockings at Target, along with the rest of of the products. I picked up some of Charlie’s favorite Purina products — along with some new products he hasn’t tried, like the Beyond Mix In Meal Enhancements and a few other things. We’ve been feeding Charlie Purina products since we rescued him, my mom’s pup Sophie, is in love with the Beneful Prepared Meals. I appreciate that Purina has such a wide range of products for different types of needs. They offer senior formulations, products to help keep your pooch at a healthy weight, along with tons of treats! And they also believe that living is bigger when we involve our pets! Which just warms my heart, because I can totally relate. For their little stockings, I used clear cello bags to give all 3 of the pets in our family the same amount of treats that they all liked. 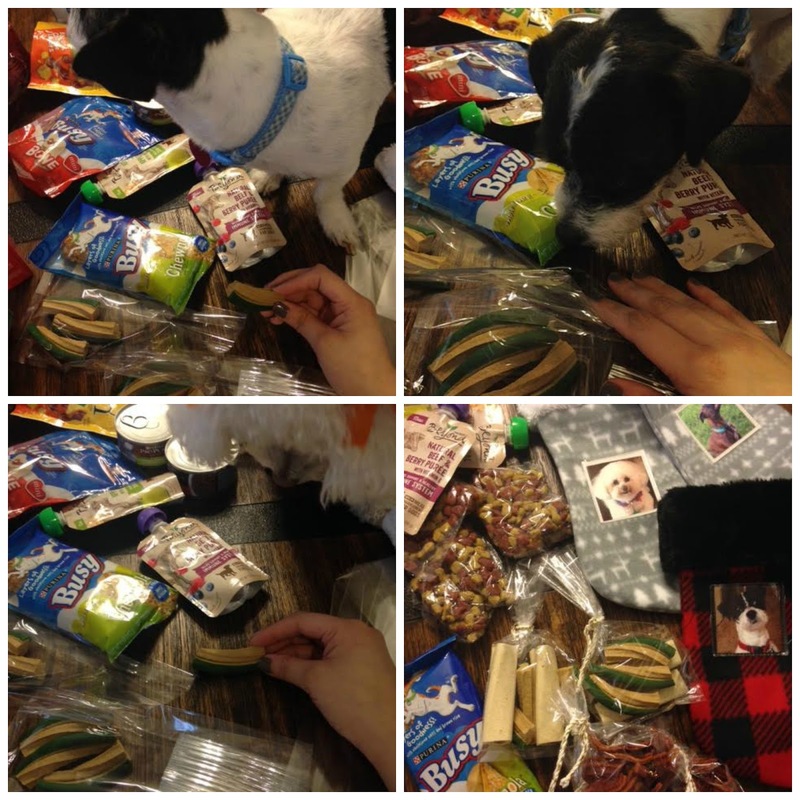 I also gave each of them something that they personally liked, for my brothers dog, the Busy Chewnola Treats, for my mom’s dog and for Charlie, a bag full of Beggin’ Littles. As you can see below, they got a sniff of the treats and begged their way up to our work area. 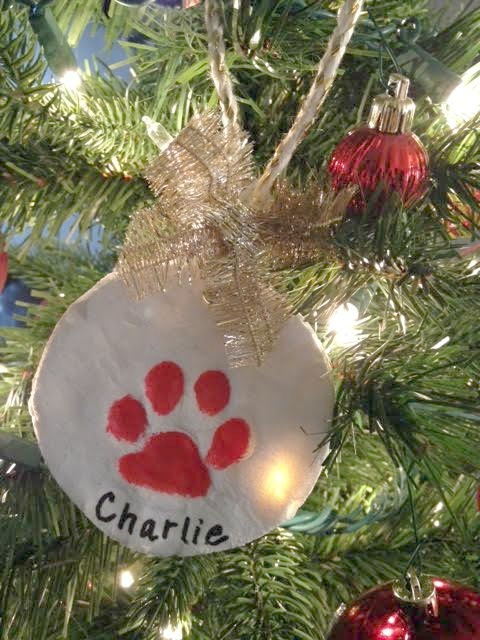 So let’s get into the making of our paw print ornament! It’s honestly very easy, the hardest thing is probably getting your pet to warm up to the idea of you touching their paws. In a medium pan mix all of the ingredients together, stir over medium heat until you reach the consistency of smooth mashed potatoes. Remove from heat and let cool. 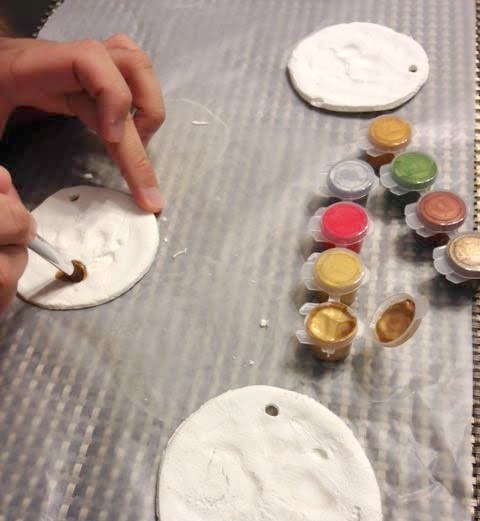 Once cool, place clay on parchment paper, smooth out and cut ornament in the desired shape. Using a straw, cut out a small circle to insert string into later. Once you have the shape you want, firmly but gently place pets paw over the clay and release. Once you have their sweet paw on the clay. Place ornaments into 175 degree preheated oven for an hour. Halfway through, turn ornaments onto the other side. Once they are finished baking and they have cooled, you can paint their paw print, add their name, date, etc. I used craft paint and a Sharpie for their name. 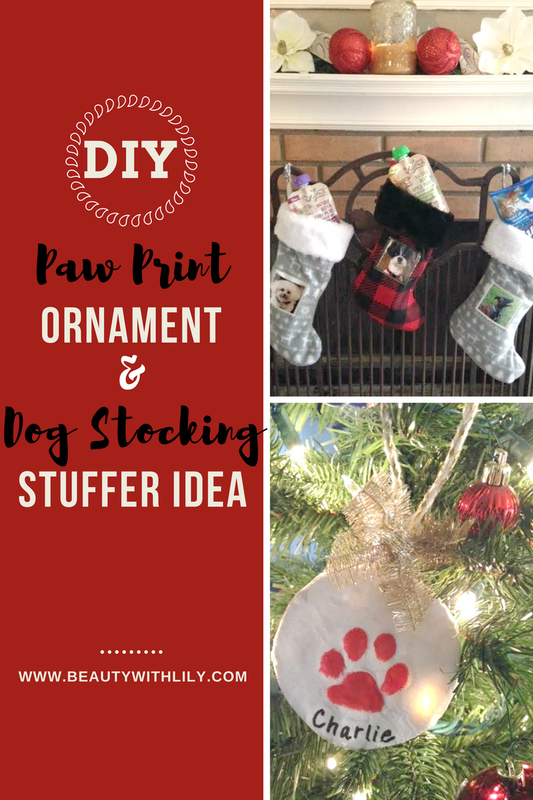 These make the perfect little gift for your pets grandparents, just throw these into their stockings and you have a gift for both your furry friend and your loved one to keep for years to come. 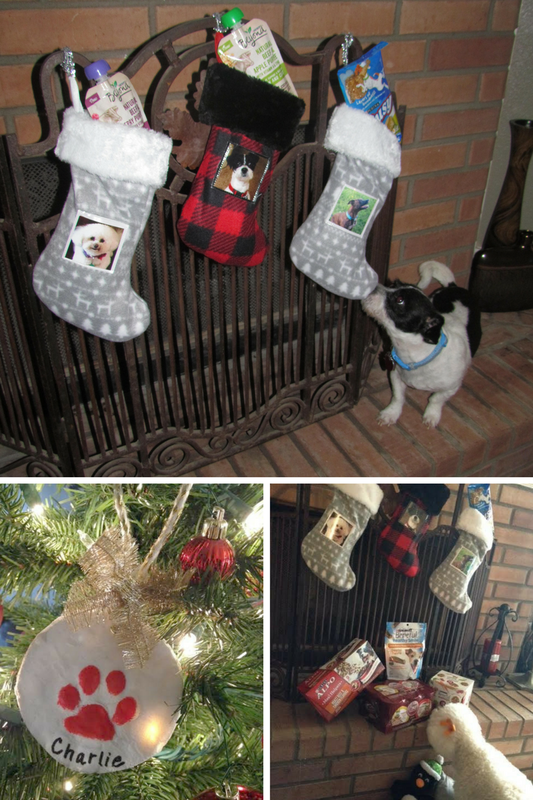 It’s so easy and fun to incorporate your fur family into your holiday traditions. After all, they are a part of our family as well. Taking some extra time and advantage of coupons like the one mentioned above, make it easier as well. 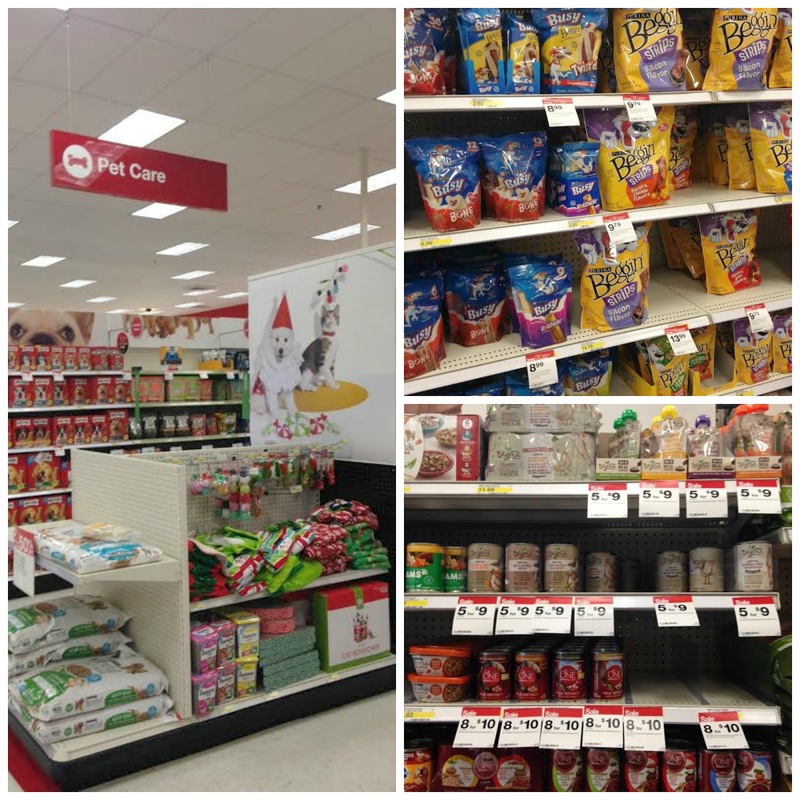 Head on over to Target the week of December 4th and spoil your four legged friends! Click here to see what all Purina offers! What are you getting your four legged friends this holiday season? Are you an avid Target shopper/coupon-er? "Skincare Session | Benefits of Vitamin C & Matrixyl*"
"How To Style Over The Knee Boots"